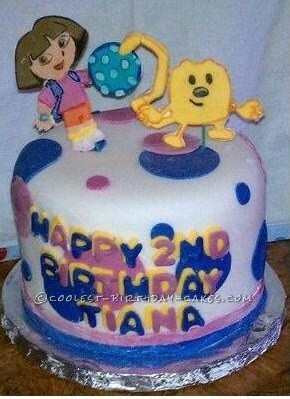 Making this Wow Wow Wubbzy and Dora cake was pretty simple until I started making Dora and Wubbzy. The fondant kept breaking between other ball and the characters. If I do a cake like this I have to figure out a way to make it stronger. This cake was a party cake and vanilla bean butter cream. I made 150 cupcakes with it but I don’t do now I why I didn’t think to take a pic of them….duh!!!! !